Mixology 101 – Does your DJ use the latest technology? In my teenage years as a DJ, some of my fondest memories were hopping on the GO Train with friends and heading downtown to go record shopping. I would spend hours in each shop carefully previewing and selecting which records to purchase. Back then I would make my purchases strictly on the basis of my own personal music preferences, especially since each vinyl cost anywhere from $12.00 to $15.00 for 2 tracks, one song on the A-Side and one song one the B-Side – a very costly hobby to say the least! As time past, my hobby started morphing into my career. People began to hire me for DJ gigs that required many genres of music to be in my repertoire. Luckily, the invention of the CDJ had come along and now I could purchase CDs to mix instead of vinyl. Although mixing vinyl is more fun and brings an element of authenticity to the art of DJing, CDJs provided the benefits of portability due to their light weight. Furthermore, it allowed a DJ to have a larger music library since the cost of a CD is much more affordable than vinyl. 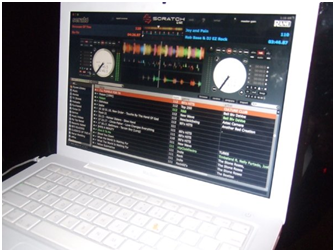 Next, in 2004, the birth of the ultimate DJ tool, Serato Scratch Live was created. Scratch Live allows manipulation and playback of digital audio files while using traditional vinyl turntables or CD players via special time code vinyl records or CDs. What this means in plain terms is that it allows for advanced music library organization and added creativity in the way a DJ can select and play music. The Sound Obsession team has benefited immensely by the Scratch Live software. Our DJs can quickly navigate through hundreds of thousands of music files in a matter of seconds to find your requests faster and to provide a dynamic music experience for any event! Overall, times change and so does technology. Make sure that the DJ you hire stays on top of new technology and music so that your event can benefit from the latest and greatest, keeping your crowd moving all night long!